We are your all volunteer Hawai’i consumer rights organization continuing the constant battle to protect you and your family from the often rapacious actions of the enormous monied interests that exert such great influence and control over our very lives. As but one example, if you had car insurance in Hawai’i before 1997, you can well appreciate our successful 30-month political battle (1995-1997) for auto insurance reform. Hawaii’s car insurance rates dropped from the 2nd highest in the nation to #20 in 1999 because of our work. Read the 1999 Pacific Business News story HERE. Because of this landmark reform, in 2012 Hawai`i was rated “the third most-affordable in the nation”. 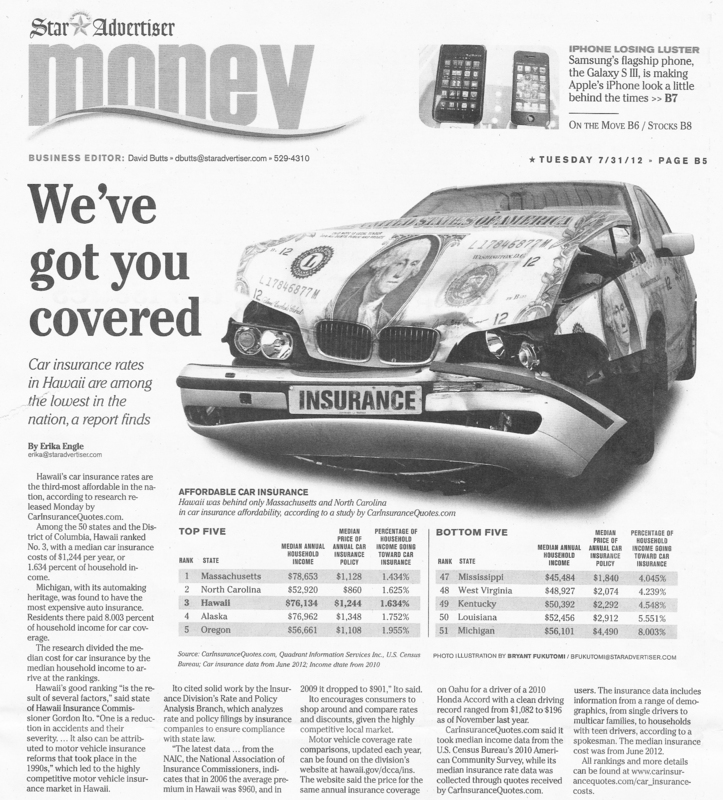 Read the 07-31-12 Honolulu Star-Advertiser article, We’ve got you covered: Car insurance rates are among the lowest in the nation, a report finds HERE. Access to affordable health care, the insurance and financial industries the petroleum & electric companies, communications including Oceanic Time Warner Cable (now “Spectrum”) and the the cell phone industry — just to name a few of the truly challenging social justice and consumer issues we’ve tackled during that past 20+ years. We’ve won some large victories and have obviously lost some — but with your help we persevere. Changing public policy about issues where so much money is involved takes time and great patience. This stunning record of accomplishment is a tribute to you, Hawaii’s enlightened consumer and we could not have done such heavy political lifting alone. Please join us and support our to inform, organize and involve voters of every stripe. In this era of uncaring, rapacious multi-national corporations, we need your active participation more than ever. To stay better informed, please “like” our Facebook page and join our email list in the right column on your computer or at the bottom of this page on a Smart phone.